(3)Direction For Use :- 2 to 3 tab. twice a day ( Dose depends upon age, weight & illness of the individuals). OR as directed by physician. (4)Benefits :- It is very useful in kaphavataj vikar, viz. 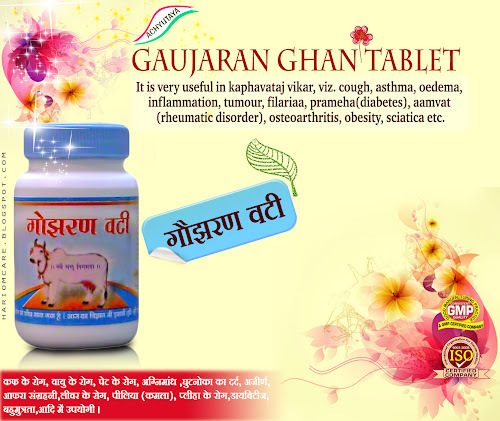 cough, asthma, oedema, inflammation, tumour, filariaa, prameha(diabetes), aamvat (rheumatic disorder), osteoarthritis, obesity, sciatica etc. Also useful in indigestion, tympanitis, sprue, worms, constipation, anaemia, jaundice, gallstones, hepatosplenomegaly, ascitis, urinary calculi, acute & chronic renal failure, benign enlargement of prostate, heart disordes, skin disorders etc. (5)Main Ingredients :- Concentrated cow urine (gaujaran ghan), Terminalia chebula (Harad), Cassia angustifolia (Sanay) etc.